Train daily for a month. Focus on even the smallest details to shave milliseconds off your time. Travel across the country to a race. Crash right out of the gate. Your weekend's over. It's a seemingly discouraging chain of events for ski racers. 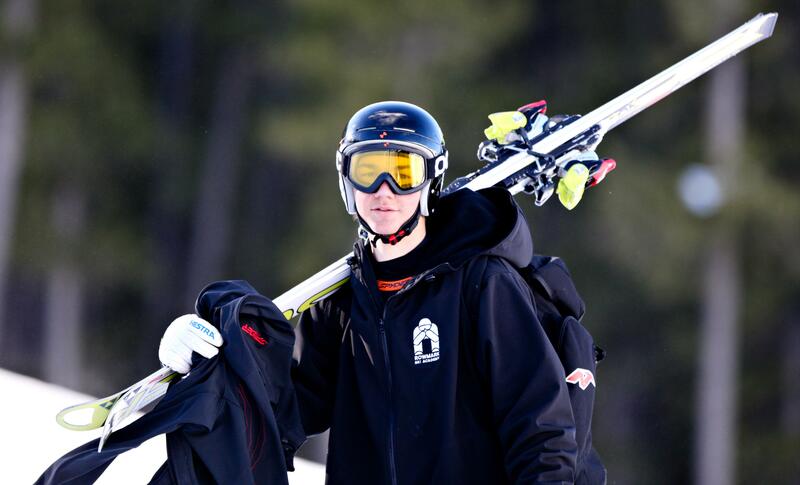 But it primed Hank Shipman '13 for perseverance after a near-fatal Rowmark Ski Academy car accident April 9, 2011. "In Rowmark, there's so much emphasis on conditioning, and nutrition, and time management, and setting goals and accomplishing them," Hank, now a college graduate, rattled off Rowmark tenets. Ski racing taught him to recognize his limitations, objectively evaluate his progress, and not dwell on short-term outcomes. He got used to the sport's ups and downs, and to spending every day training and striving for improvement. And those qualities have continued to serve him ever since he stopped racing, the 22-year-old keynote speaker told the audience at Rowmark's fall barbecue last month. Toward the end of the ski season in 2011, coach Scotty Veenis was driving Hank and five other Rowmarkers—Jake Graves, Zach Merrill, Andrew Rutledge, Hunter Stuercke, and Zach Young—north on Oregon's Highway 35, back to their hotel after a race at Mount Hood Meadows Ski Resort. A southbound driver in a Jeep Wrangler illegally crossed a double-yellow line to pass a semi-truck. The Jeep struck Rowmark's Chevy Suburban head on—in a potentially life-saving reaction, Scotty swerved, and the front-left corner of the Suburban took the brunt of the impact. Hank had been sitting behind the driver's seat. The then-sophomore slept through the accident, but awoke right after. Hank and Scotty endured the most severe injuries of the group. They both suffered significant head trauma. Scotty also had a ruptured lung; a shattered ankle; a broken femur, hip, and ribs; and more. Hank's primary injuries included a compound femur fracture, a broken scapula, and a broken neck resulting in a spinal cord injury. The five other passengers sustained concussions. Everyone experienced some level of traumatic stress. In the foggy aftermath, while stuck in the Suburban, Hank said he remembered moving his lips to try to tell his teammates he was alive, but he couldn't pull air into his lungs. Those with minor injuries sprung into action—Zach Young grabbed a fire extinguisher from the semi-truck to quell flames on the Suburban. First responders started showing up; they used Jaws of Life to remove car doors, and they life-flighted Hank and Scotty to Portland hospitals. In the helicopter, Hank started to realize the extent of his injuries. He recalled asking a nurse if he'd be able to race again that season. He heard her request a tourniquet for his compound open femur, and he knew he wouldn't. Hank, a Rowland Hall lifer, had joined the fledgling Rowmark Junior Program as a second grader in 2002, the same year Rowmark Director Todd Brickson started. Todd watched Hank grow up: he was always a fun, hardworking, good kid, and an incredible multisport athlete, Todd said. Then, the accident. "We were reeling," Todd said with a nod and a sigh. "That was kind of burned in our memory forever." The Rowmark and Rowland Hall community rallied. Hank stayed in the Portland hospital for 10 days, then came to Primary Children's Hospital (PCH) here in Salt Lake City. Along with Hank's family, a constant stream of classmates, coaches, teachers, and even skiing stars such as Ted Ligety and former Rowmarker Andy Phillips visited him in the hospital. "The support was everything," Hank said at the Rowmark barbecue. "When you have an entire community pulling for you and lifting you up, it makes it a lot easier to overcome challenges." After the accident, doctors put a metal rod in Hank's femur and 50 staples in his head. He underwent two spinal-fusion surgeries; the second one, though successful, had complications that left Hank temporarily using a feeding tube. He received cognitive and speech therapy, including revisiting second-grade math. According to Todd, no one argued with Hank when he said he'd leave the hospital on his feet. "But not a lot of people believed him, either," Todd said. Hank's mom, Julie Shipman, recognized her son's unwavering determination to heal. "He seemed to just know that he would," she recounted in a video. "The walker replaced the wheelchair, and crutches replaced the walker." And when doctors released Hank after about three months in the hospital, he walked out on his own two legs, with help from just one crutch. At the fall barbecue, Hank told the Rowmark community that his racing mentality kept him dissatisfied—but not angry—during his recovery. "In ski racing, you work for a long time paying attention to tons of details, and you're often deprived of any immediate gratification," he said. So in rehab, he focused on those minor details, and the athlete's trifecta of exercise, nutrition, and sleep. "The progress of my recovery was slow and agonizing, but it was easy to track," Hank said. "From one day to the next, I didn't necessarily feel like anything was happening, but if I reflected on where I was two weeks or a month prior, it was easy to tell that I was regaining significant strength and movement." Hank's rehab—including three years at Sandy's Neuroworx, a renowned physical therapy clinic that focuses on neurological rehabilitation—sparked a new passion. Before the accident, he said, he was narrowly focused on ski racing, and had no other plans for the future. Afterward, he shifted his goals from sports to medicine. As a junior, he volunteered in PCH's Neuroscience Trauma Unit rehab room, where he worked with patients and talked to them and their parents about his own recovery. Since high school, Hank has also intermittently volunteered at Neuroworx, where he makes special connections with patients—he knows exactly what they're going through. In April, he earned a bachelor's in movement science from the University of Michigan, then applied to 25 medical schools across the country. He's keeping his options open, but is interested in pursuing rehab-based medicine and wants a job with significant patient interaction. Todd called the accident a watershed experience for Hank. The skier learned about his own injuries and how to move again, and he befriended kids and adults facing similar—and sometimes more serious—conditions. "He all of a sudden latched onto this," Todd said. "That's kind of where the blessing in disguise is. Being able to learn about what he had to do to come back, and what others were going through, it just became a passion of his, and kind of a calling." Scotty also made a full recovery and now coaches the US Men's World Cup Ski Team. "You'd hope when anybody goes through that sort of life-changing, traumatic experience, that they'd handle it the way that Hank did and the way that Scotty did," Todd said. "I don't think they could have done a better job of turning a negative into a positive." Hank played varsity baseball and golf before graduating, and even returned to recreational skiing. In spring 2013, Rowmark started giving out the Hank Shipman and Scotty Veenis Perseverance Award in the duo's honor. Hank also won the 2013 Spirit of Sport award from the Utah High School Activities Association. Now, Hank's daily life is barely inhibited. He has incomplete quadriplegia and Brown-Séquard syndrome—he lost strength on the left side of his body, and lost feeling in the right side. But in true Hank style, he pursues new ways to continue his physical therapy. Since July, classmate and fellow med-school applicant Saeed Shihab '13 has been helping Hank learn to rock climb—an activity the former Rowmarker said bolsters his grip strength and range of motion in his shoulder. On the precipice of hearing back from med schools, Hank still extols his college-prep education. "I'm one of the students that constantly brags about Rowland Hall," he said. The writing, study, and communication skills he acquired here gave him a leg up at Michigan, he added. And he praised the expertise and helpfulness of Rowland Hall teachers—and not just from an academic standpoint. He still remembers his first day back at school in fall 2011, after the accident. He shuffled in on crutches, and the late Peter Hayes grabbed his backpack, helped him up the stairs, and cheered him on. Today, the Rowland Hall community can't help but continue to cheer for Hank, who'll be anxiously checking his email until at least one of his 25 med school applications proves successful.